Just two days after launching a Bulgarian communications satellite from Florida, a SpaceX Falcon 9 rocket lifted 10 Iridium NEXT telephone relay stations into orbit Sunday after a foggy afternoon launch from California. Despite blustery winds and high seas, the California rocket builder also was able to recover the booster's first stage with a pinpoint landing on an off-shore droneship, SpaceX's 13th successful landing in a row. More important for Iridium, it was the second batch of 10 Iridium NEXT spacecraft successfully launched by SpaceX under contracts with the satellite telephone provider to deploy 75 of the 81 relay stations being built to replace the company's current fleet of aging first-generation spacecraft. "Now that we're into the launch phase after more than seven years of effort, we're poised to complete the replacement transformation of our very unique network through a total of eight launches spread over a very short 18 months," Iridium CEO Matthew Desch told reporters last week. "After this second launch, we have six more launches scheduled with SpaceX over the following 12 months, so our network activities in space are really going to get a bit frenetic." Iridium telephone customers rely on 66 satellites operating in six orbital planes to make and receive calls anywhere in the world. The company's original block 1 satellites are being replaced by 66 Iridium NEXT spacecraft with nine more serving as in-orbit spares. Another six will be held on the ground for launch as needed. Desch said the rapid-fire launch pace will quickly pay off "as completing Iridium NEXT will mean the start of some very important and groundbreaking new global services as well, as the financial transformation of Iridium itself, as we finally approach the financial maturity that we embarked on when the system was conceived almost 30 years ago." SpaceX launched the first 10 Iridium NEXT satellites from Vandenberg on Jan. 14, putting the spacecraft into a near-polar orbit tilted 86.4 degrees to the equator, one of six orbital planes used by the company to create its network. The 10 launched Sunday were released into a different plane, part of a complex process to replace the older spacecraft in a satellite-by-satellite fashion to avoid any network interruptions. "This activity ... is quite unprecedented in the commercial aerospace industry, at least at the volume and pace we're undertaking," Desch said. "Of course, Iridium is the largest commercial satellite network in space so it's not surprising. But the amount of effort that we're undertaking to perform this network swap in space is quite amazing." Sunday's countdown proceeded smoothly to zero at 4:25:14 p.m. 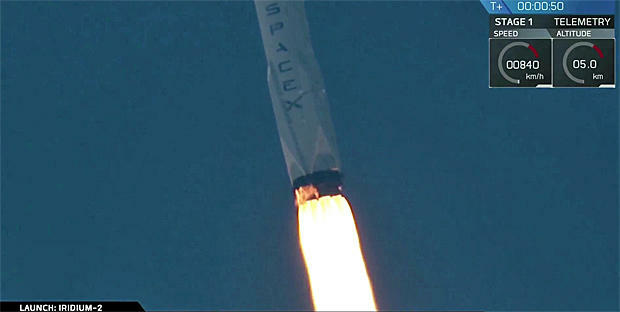 ET when the Falcon 9's nine Merlin 1D first-stage engines ignited and throttled up, generating 1.7 million pounds of thrust and a billowing cloud of exhaust. After a final round of lightning-quick computer checks, the booster was released from pad 4E to begin its fiery ascent. Quickly climbing out of dense fog into a clear blue sky, the Falcon 9 arced away to the south over the Pacific Ocean northwest of Los Angeles. The first stage engines burned for about two minutes and 24 seconds to propel the vehicle out of the dense lower atmosphere. The engines then shut down and the stage fell away to begin its descent to the droneship "Just Read the Instructions." Three of the booster's engines re-ignited to help the booster reverse course followed a few minutes later by another three-engine firing to slow down for re-entry into the lower atmosphere. Two minutes after that, a single engine ignited as planned, four landing legs deployed and the booster settled to a touchdown on the droneship. Live video from an automated camera on the ship showed the barge rocking up and down in heavy seas with the Falcon 9 first stage positioned near the center of the landing deck. It was the 13th successful booster landing in 18 attempts, the eighth on a droneship and the ninth successful recovery in a row, demonstrating the growing maturity of SpaceX's on-going drive to lower launch costs by recovering, refurbishing and re-launching stages that otherwise would be discarded. The first stage launched Friday from the Kennedy Space Center, which first flew in January to help put the first 10 Iridium NEXT satellites into space, also landed on a droneship. It was the second previously flown booster to make a second flight. But as with all SpaceX launches, the landings are a secondary objective. The primary goal is putting the customer's payload into orbit and one minute and 15 seconds after the booster landing Sunday, the Falcon 9 second stage engine shut down to complete the first of two required burns. The engine re-ignited 52 minutes after launch, burning for just a few seconds to reach the required orbit. The 10 Iridium NEXT satellites then were deployed one at a time over 15 minutes or so from a dispenser atop the second stage. With each satellite able to communicate with up to four others -- one ahead, one behind and one to either side in adjacent orbital planes -- the Iridium system provides a global communications network that includes hand-held phones, machine-to-machine devices and ship- and aircraft-born data transmitters. Each of the 1,896-pound solar-powered satellites, designed by the European aerospace giant Thales Alenia Space and mass produced assembly-line fashion by Orbital ATK in Arizona, feature a phased-array antenna that can generate 48 beams over a footprint 3,000 miles across. Each satellite also is equipped with high-speed links to ground stations and the required satellite-to-satellite cross links. It is those relay cross links that create a global network allowing users anywhere in the world to communicate cell phone fashion. "Iridium NEXT features the same unique interconnected satellite architecture as the original constellation, which is the key feature that distinguishes Iridium from all other commercial satellite operators," Desch said earlier. "Crosslinks, as we refer to them, allow our satellites to bounce data and voice calls around the world nearly instantaneously, creating a true web of coverage around the entire planet, the key advantage of our network and one of the biggest reasons for our growth and success." The new spacecraft also will carry circuitry provided by Harris Corp. to track ships at sea on a minute-by-minute basis and another Harris-built device, provided by a multi-agency consortium known as Aireon, that will track aircraft anywhere in the world.